After years of fighting against LGBT rights in the state of Florida, Attorney General Pam Bondi is still whining that she was asked about her sudden change of tone towards the LGBT community in the wake of the Orlando nightclub shooting (and hundreds of TV cameras broadcasting nationwide). On Tuesday, CNN's Anderson Cooper asked her about the turn of heart, wondering if it isn't somewhat hypocritical to now claim to be an LGBT ally after fighting against marriage equality for years. Wednesday, Bondi went on a friend's radio show to complain about the encounter, and then yesterday, she went running to Fox News for a sympathetic ear. Ironically, she gets on Fox News saying she still wanted to talk about scams going on involving the Orlando shooting but pivoted immediately into a "woe is me" moment. Along the way she shrugged saying the CNN interview "is what it is" but clearly came on Fox News merely to whine. 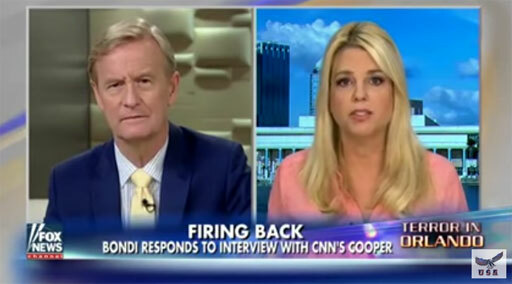 Grow up and own your positions, Ms. Bondi.